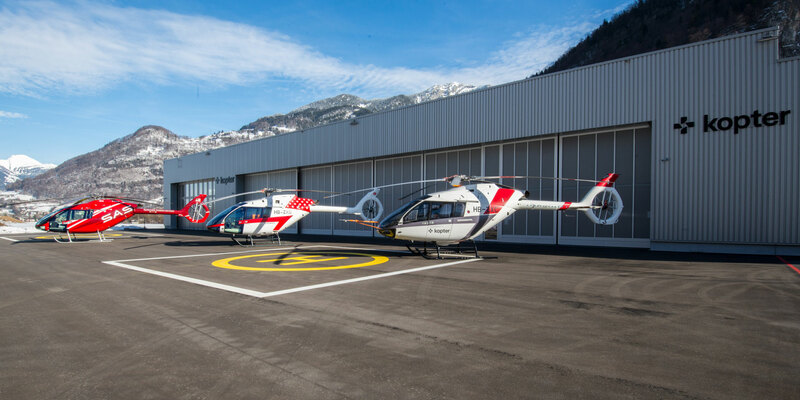 Kopter Group plans to expand its headquarters and SH09 helicopter assembly facility in Mollis, Switzerland. Its current 13,800-sq-ft facility will be augmented by a new 66,000-sq-ft assembly building, which is scheduled for completion in 2021. Kopter Group has begun plans to build a new 215,000-sq-ft pre-assembly building at its Mollis, Switzerland headquarters, it announced today. Construction is expected to begin in the third quarter, and the facility is expected to become fully operational in 2021. The new building will house production of dynamic components such as rotor blades, gearboxes, and rotor heads, as well as testing rigs and a central warehouse. Kopter’s existing 13,800-sq-ft facility will be used for final assembly of the SH09 light turbine-powered helicopter and administrative offices. The combined new facility at Mollis will be the company-wide center for production, assembly, flight-testing, training, and maintenance for its Honeywell HTS900-powered SH09 light-single. Kopter expects to ramp helicopter production up to 50 units annually at Mollis within the next five years and fabricate an additional 150 subassemblies for final assembly at facilities planned for the U.S. and Asia. According to Kopter, projected growth is expected to boost employment at Mollis from the current 100 to 400 within five years. Kopter Group CEO Andreas Löwenstein said the new facility “will allow us to work in the best conditions and to serve our customers worldwide."